Filling public spaces with permanent sculptures, memorials and artwork is an important aspect to the overall aesthetic of a city. Vienna has hundreds of public artworks available to admire as a free alternative to galleries. Here are a few of the most powerful and eye-catching. 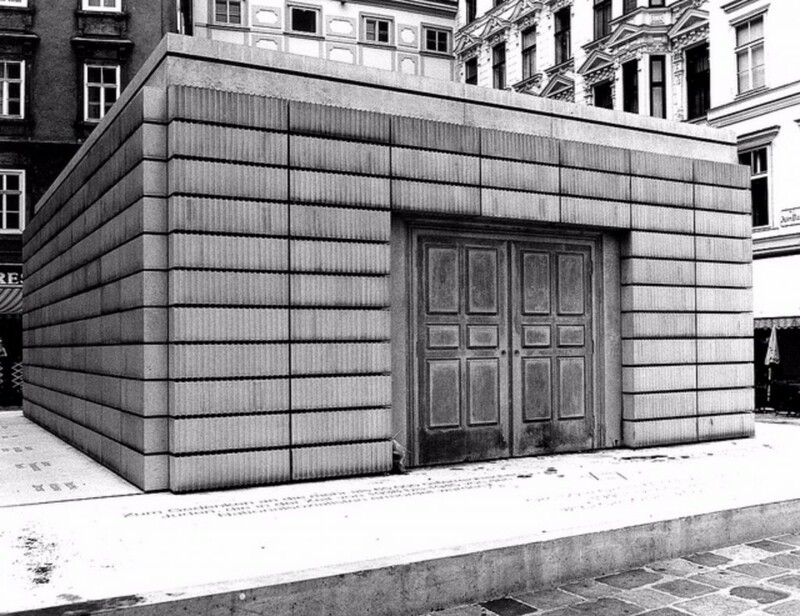 British Turner Prize-winning artist Rachel Whiteread unveiled her piece, The Nameless Library, to the public in 2000, after being granted a commission to create a memorial for the Austrian Jewish Holocaust victims. What she produced is a powerful and moving sculpture. Composed of steel and concrete, it is a colourless four cornered, windowless structure, provoking images of confinement and isolation. Spines of books line the outside walls, intended by Whiteread to evoke feelings of ‘empty spaces’. The tribute, located at Judenplatz, functions well as a harrowing reminder of the painful past of the Nazi era and the lasting impact on Austria’s citizens. The Vienna U-Bahn is an unofficial gallery of over 20 artworks, surreptitiously lurking in the tunnels of the underground stations. On the mezzanine of the U2 and U1 at Karlsplatz, you will pass work by Austrian artist Peter Kogler. The installation is a series of interconnecting grey tubes, an intriguing departure from the seamless uniformity of the station’s architecture. Kogler’s work functions as a symbol for connection and the winding underground passages of the city’s U-Bahn system. The work was unveiled in 2012 and has since solidified itself as a timeless work in one of Vienna’s busiest commuter routes. On the Ballhausplatz, this memorial stands in memory of those whose lives were cut short at the hands of the Nazis, as deserters and victims of the brutal military system. Etched into the concrete are just two words by Scottish poet Ian Hamilton Finlay, a simple yet devastating verse that reads: ‘all alone’. From a birds-eye view, viewers will see that the structure appears as an X shape — a striking and stifling symbol of power and status. The artist wanted those who interact with the work to feel a part of it, as an autonomous individual, just as those who the memorial pays respect to may have felt as they were making the decision to stray from a regime they did not believe in. The Nazi Flak Towers in Vienna are a set of three staggering eyesores, dominating their surroundings with a bold stature you’re unable to ignore. Built during WWII as anti-aircraft towers, their infrastructure is as such that they cannot be destroyed without risking damage to neighbouring buildings. ‘L Tower’, in the Mariahilf district was optimistically repurposed as an aquarium (named the House Of The Sea), with a climbing wall crawling up one side. The writing on the top of the tower, an installation created by artist Lawrence Weiner in 1991 that reads ‘In The Still Of The Night’, is a nod to the destruction that Vienna suffered during nighttime raids and acknowledgement of the contradictory co-existence of war and peace. This piece can be seen in the centre of the pool outside the lavish Karlskirche in one of the city’s most central squares. Unmistakably a creation of Moore, with the giveaway signs of curvaceous, arching, interwinding structures, this sculpture was unveiled to the city by the artist in 1978. It is a wonderful and complementary addition to the space that surrounds the iconic baroque-style church; one of Vienna’s finest architectural feats. This ethereal work was installed by Danish-Icelandic contemporary artist Olafur Eliasson on the 48-metre-long façade of the Verbund-Zentral building. Mysterious and enthralling, Yellow Fog was originally shown in New York City in 1998, before being moved to its permanent residence in the Am Hof Square in Vienna’s old city centre. Eliasson’s work plays with the natural elements; manipulating reflections, light and water. One of his most lauded works was ‘Green River’ when the artist transformed the colour of rivers in Iceland, Norway, LA and Tokyo. Comprising 32 lamps, Yellow Fog sees the light reflect upon mist that emerges from grates at the base of the building after sunset and then transcends across the square.